With the cost of groceries continuously getting higher, I'm determined to serve more frugal meals without skimping on quality. I also want to get more creative as I don't want us to feel deprived as I attempt to save money by lowering our weekly grocery bill. Since I like to talk about food almost as much as I enjoy eating it, you know I'm going to want to share the low-cost dinner ideas with all of you. 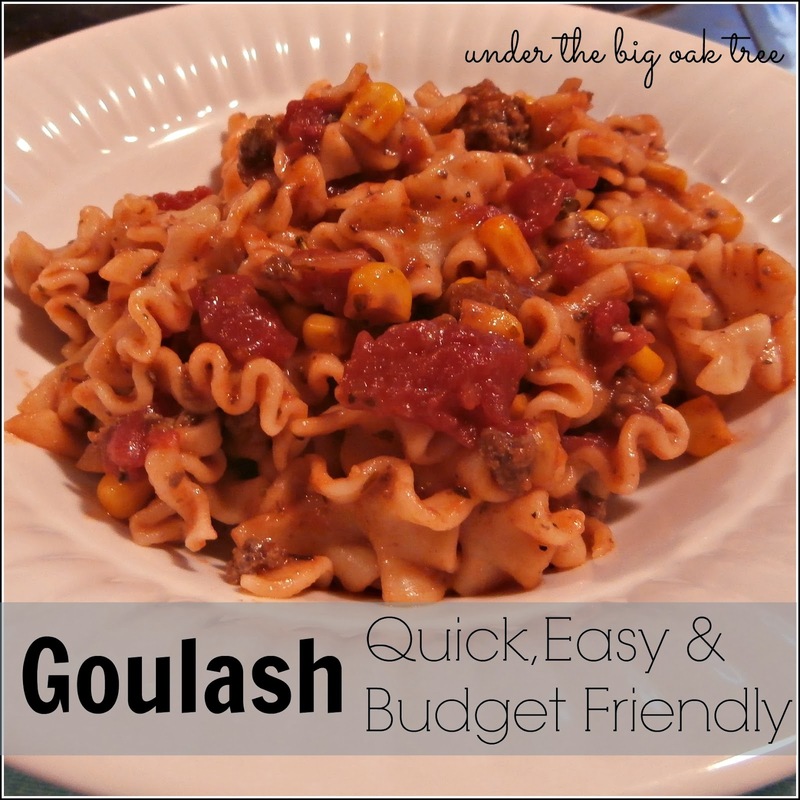 Growing up, Goulash (or Hamburger Macaroni) was a dish we ate often at our house. Mom kept it pretty basic, I'm not sure if it was to keep the costs down or to ensure that the picky eater in the house (me) would just eat it without too much of an argument. Over the years, I've seen recipes for Goulash with a tomato base rather than a gravy base. But I've always stuck to using brown gravy mix...just like mom. While trying to plan a month's worth of dinners using mostly what we have in the pantry or freezer, I decided to finally give the tomato-based goulash a try. Mmmm! I was not disappointed! In a large pot or dutch oven, cook ground beef over medium low heat until no longer pink. Add the pepper, season salt and Italian Seasoning. Allow to cook about a minute, until fragrant. Stir in the tomatoes, sauce and corn. Reduce heat and allow to simmer for 10-15 minutes. Combine the meat mixture with the cooked pasta. The original recipe called for one pound of vegetarian ground crumbles. This isn't a product we usually have in our home so I used ground meat instead. I reduced the amount of beef in the recipe, to keep the cost down. Since I was switching up the Goulash base, I also decided to try a different pasta than our usual elbow macaroni. Muffaletta pasta was a nice change, but any mid-size pasta would work. Since all of the ingredients were already in our pantry, I'm not sure of the exact cost of this recipe. My guess is that it come in at $5 or under for the entire pot of meat and noodles since we only purchase these items at sale price. I really enjoyed the flavors in this dish and didn't miss the brown gravy at all. This recipe makes a pretty hearty meal. My guess would be 6 servings with salad and bread on the side. We got about 4 hearty portions from the dish, but we skipped the bread and salad. I served half one night and froze the other half for another night.